CARFAX 1-Owner, Mazda Certified, GREAT MILES 7,920! EPA 31 MPG Hwy/25 MPG City! Heated Leather Seats, Sunroof, NAV, Satellite Radio, Premium Sound System, Onboard Communications System, iPod/MP3 Input, RETRACTABLE CARGO COVER CLICK NOW! Leather Seats, Navigation, Sunroof, Power Liftgate, Heated Driver Seat, Back-Up Camera, Premium Sound System, Satellite Radio, iPod/MP3 Input, Onboard Communications System, Aluminum Wheels, Keyless Start, Dual Zone A/C, Blind Spot Monitor, Lane Keeping Assist. Rear Spoiler, MP3 Player, Privacy Glass, Keyless Entry, Remote Trunk Release. PREMIUM PACKAGE Heated Rear Seats, Windshield Wiper De-Icer, Heated Steering Wheel, Active Driving Display (Windshield Type), Traffic Sign Recognition (TSR), RETRACTABLE CARGO COVER. 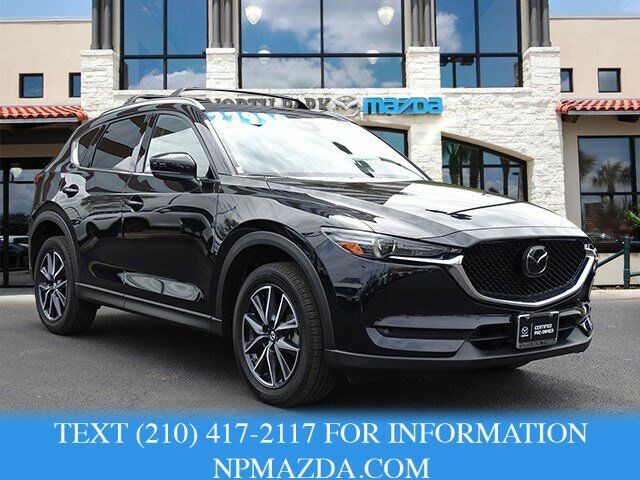 Mazda CX-5 Grand Touring with JET BLACK MC exterior and BLACK interior features a 4 Cylinder Engine with 187 HP at 6000 RPM*. "Since it's sharp and communicative, you can take corners at speeds greater than rivals without squealing tires or feeling as if you're out of control. The car is unfazed by quick left-to-right transitions. This is the best-handling small crossover. No doubt about it." -Edmunds.com. Great Gas Mileage: 31 MPG Hwy.